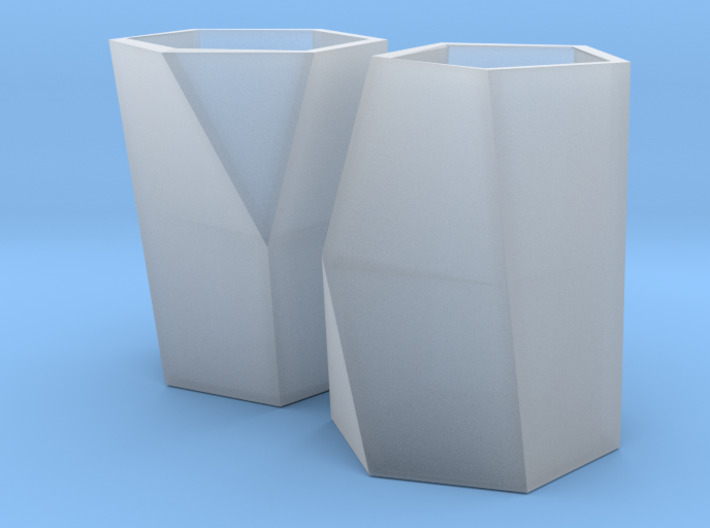 There's a new shape in town! 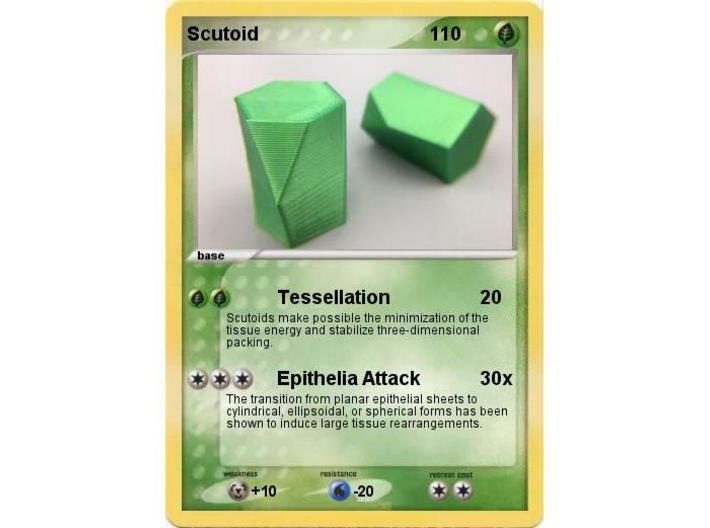 In a new article Scutoids are a geometrical solution to three-dimensional packing of epithelia in the journal Nature, a group of scientists just introduced a new shape that they have dubbed a "Scutoid". 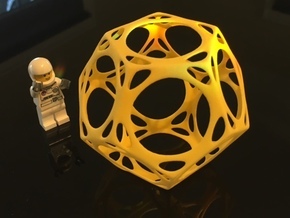 Please note: the Small and Large versions of this model are the same size, but "Small" is hollow and "Large" is solid. Choose whichever one you prefer before ordering. 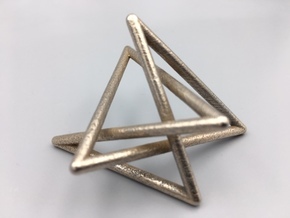 Mathematically, a Scutoid is a Prismatoid to which one extra mid-level vertex has been added. This extra vertex forces some of the "faces" of the resulting object to curve. This means that Scutoids are not polyhedra, because not all of their faces are planar. In this model, and in the Nature article, the Scutoid has one hexagonal face, and on the flipside, one pentagonal face. 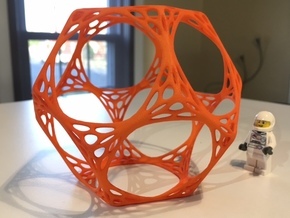 In the default configuration of this model, we scaled the faces so that the edges of the hexagonal and pentagonal faces are equal. We've also chosen to make the top and bottom faces regular, although biologically that is probably not a requirement. 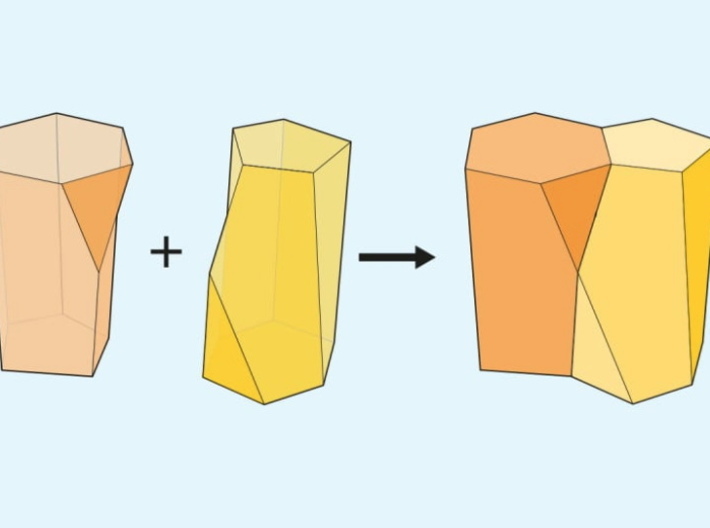 For the computational biologists who created/discovered the Scutoid, the key property of the shape is that it can combine with itself and other geometric objects like frustums to create 3D packings of epithelial cells. This product is for a PAIR of scutoids that pack together perfectly. History, thanks, and credit: Thanks to @bpmarkowitz for suggesting that we try to 3D print this model! 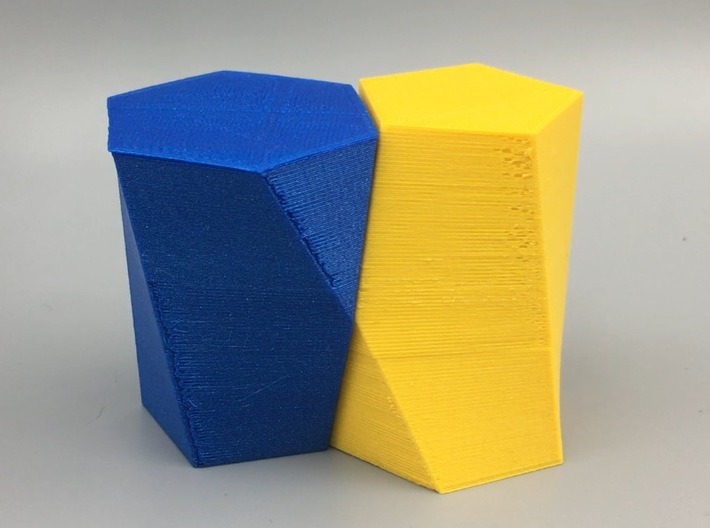 Kitwallace has made a 3D-printable planar-faced version of the Scutoid based on Ed Pegg's vertex coordinates. This model differs in that the sides curve. Have a 3D printer? 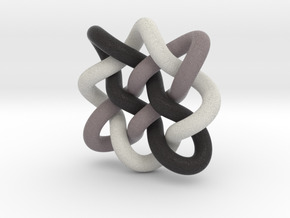 A free customizable version of this model is available on our Thingiverse page. Read more at [url=http://Read more at [Hacktastic](http://mathgrrl.com/hacktastic/2018/07/pairs-of-packable-scutoids/).]Hacktastic[/url]. Disclaimer: I'm not a biologist or a scientist, and the article that announced this shape is pretty technical, so please don't rely on my words above for any Real Science. If you're a scientist who understands this new shape and how it is used, please drop me a note in the comments!